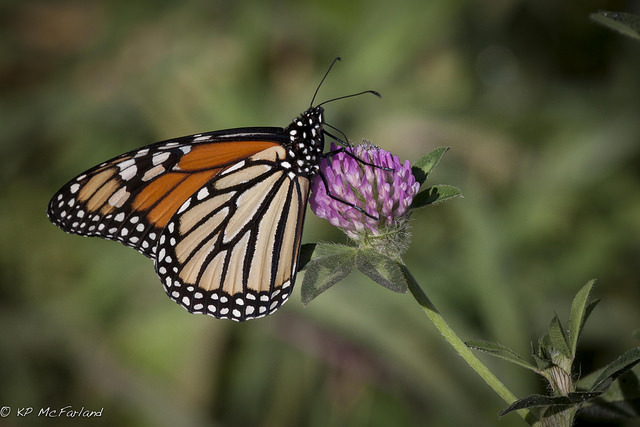 Science, butterfly and nature buffs, and other members of the public across the country are being asked by the experts to get out and look for milkweed plants to count monarch eggs and caterpillars, then to share their findings with Mission Monarch, powered by eButterfly. The Insectarium, a Montréal Space for Life institution, in cooperation with the Institut de recherche en biologie végétale (IRBV), the Université du Québec à Rimouski, the University of Ottawa and the University of Calgary, is currently conducting a national scale study of monarch breeding habitats and asking citizens to get involved. The data collection protocol is very easy to follow and was designed so that everyone can participate. Anyone interested can just go to the Mission Monarch website, to sign up and find answer to their questions. It’s a great way to enjoy the summer and some outdoor fun with friends or family. This three-pronged research project is aimed at determining whether the availability of milkweed and breeding sites are limiting monarch reproduction in Canada. First of all, the researchers studied the geographic distribution of monarchs and their host plant, milkweed using advanced technology to map the distribution of the butterflies and their host plants. The hardest part is still to come, though: identifying the key monarch breeding areas in Canada by inventorying eggs, caterpillars, pupae and butterflies in natural habitats across Canada. Given the vast territory to cover, the researchers are now calling on all citizens to get out and help collect this priceless data, to optimize efforts to re-establish migratory monarch populations. “The Government of Canada is proud to support citizen science initiatives like the Mission Monarch project announced today. Canadians are invited to join in this initiative to help monarch conservation. In fact, Environment and Climate Change Canada will be implementing this initiative in our protected areas within the monarch breeding range in Eastern Canada. We have supported actions benefitting pollinators, including monarch butterflies, with funding of approximately $3.8 million over three years including funding for essential research on monarch habitat in Canada,” says the Honourable Catherine McKenna, Minister of Environment and Climate Change. This major project, with $216,000 in three-year funding from Environment and Climate Change Canada, is being directed by Maxim Larrivée, Section Head, Entomological Collections and Research at the Montréal Insectarium. A number of eminent researchers in this field are co-investigators on the project: Jeremy Kerr, from the University of Ottawa, Dominique Berteaux, from UQAR, and Paul Galpern, from the University of Calgary, who are all associated with the Habitat Stewardship Program (HSP) for Species at Risk. “With this vast study, Montréal is positioning itself as a leader in monarch conservation research. This significant collaborative effort is allowing us to enlist experts from the Insectarium, the IRVB and a number of institutions dedicated to biodiversity research, communication and education. At the same time, we are asking citizens to get involved in the research, to visit sites where milkweed grows and to look for monarchs,” says Réal Ménard, Montréal Executive Committee member responsible for sustainable development, the environment, major parks and green spaces.